Henrik Lundqvist, at practice yesterday. The Rangers are making their deepest playoff run in 20 years this spring, having dispatched Philadelphia, Pittsburgh, and Montreal in the Eastern Conference Playoffs. But now they’ll face their toughest opponent yet in the Los Angeles Kings, the 2012 Stanley Cup champion and a heavy favorite to win their second title in three years. 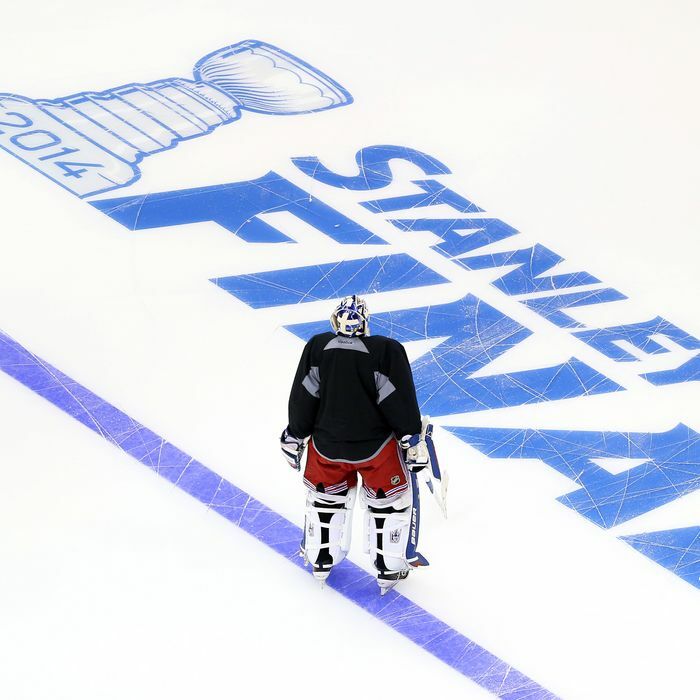 The Rangers’ run has been inspired so far, but they can they really pull this off? Here are five reasons they have a chance — and one thing that will ultimately doom them. 1. They are, somehow, the more rested team. The Rangers have played 20 of a possible 21 games through three rounds, and became the first team in NHL history to reach the Cup Final after starting the playoffs with two seven-game series. But the Kings, who played the maximum 21 games, became the second team to accomplish that just days later. The Rangers, who clinched their Final berth on Thursday, have had five full days off. The Kings, who clinched on Sunday, have had just two. 2. The Rangers have been great on the road. The Kings (for the first time in these playoffs) have home-ice advantage, but the Rangers have been a great road team all season. They finished the regular season with the most road wins of any team in the East, and have won some big road games in the playoffs, including two elimination games against Pittsburgh and the first two games against Montreal. Winning at least one of the first two games is crucial, and for what it’s worth, the Rangers are 2–0 in road Game 1s this year. 3. They really have been a different team since the middle of the Pittsburgh series. It sounds like the kind of narrative that the hockey media would push because it’s a good story, but it’s also absolutely true that the Rangers have been a better team since Martin St. Louis’s mother passed away prior to Game 5 of the Penguins series. By all accounts, the team rallied around him and was stronger for it. The result on the ice has been fairly dramatic: They’re playing with the right mix of speed and smarts, and wore down Montreal not just with an impressive north-south game, but by winning battles in the Canadiens zone. They’re now playing with a much-needed sense of desperation, even when ahead in a series. That’s new for them: The Eastern Conference Final was the first series in which they didn’t face elimination at any point since 2008. The return of the injured Chris Kreider, a speedy player who’s coming into his own under Alain Vigneault’s up-tempo system, was undoubtedly a factor in their turnaround. But something’s going on with this team. It’s more concrete than “the hockey gods smiling on them,” or anything like that. Maybe it’s something as simple as increased confidence after a dominant Game 5 win against Pittsburgh. But something’s been happening here, and who knows how far it will take them. 4. They’re one of the few teams that can match goalies with Los Angeles. Would the Rangers have had an easier time against Corey Crawford? Probably. Jonathan Quick is one of the best goalies on the planet. But Henrik Lundqvist is in that class, too, and more important, Lundqvist has been better than his L.A. counterpart this spring. Granted, the Kings had to play the two best offenses in hockey (in terms of goals per game this season) and three of the top six. But Lundqvist, playing at the top of his game, has posted better numbers than Quick, and he’s been more consistent, too. Lundqvist has had a couple of hiccups, but Quick’s gotten lit up on several occasions in these playoffs. Quick opened the postseason by allowing 16 goals in three games, and against Chicago, posted just an .889 save percentage. (Lundqvist, meanwhile, was pulled twice in these playoffs but both times bounced back with fantastic games.) There’s reason to believe the Final will be a lower-scoring series than what the Kings just went through against Chicago, so every goal will be huge. 5. The Kings’ offense isn’t always as dominant as it’s been lately. Los Angeles leads all teams with 3.48 goals per game in these playoffs. But even with so many big names in the forward corps — guys like Anze Kopitar and Jeff Carter — they were among the lowest-scoring teams in the league during the regular season. (They were 26th out of 30 teams.) Part of the jump in scoring, of course, can be attributed to the acquisition of former Ranger Marian Gaborik, who leads the league with 12 postseason goals. But FiveThirtyEight took a look at the Kings’ shooting percentages (a good way to gauge how big a part luck plays in goal-scoring), and found that the Kings are probably somewhere in the middle of those two extremes. In a relatively short series, that may not matter, particularly when the team obviously has a lot of offensive talent and is on a roll. But they’re not necessarily the offensive juggernaut they may appear to be right now. They’re going to have trouble scoring. For years, the Rangers have excelled at goal-prevention and struggled with goal scoring. Even under Alain Vigneault, whose system is more concerned with offense than previous coach John Tortorella’s, they’ve been a middle-of-the-pack scoring team, both in the regular season and playoffs. Anecdotally, scoring no longer seems like the chore it was under Tortorella, where they had to work so hard for each and every goal. Their offense comes a bit more naturally now, which if nothing else makes it more fun to watch. But against a team like Los Angeles — and a defensive corps led by the great Drew Doughty — scoring will be at a premium. The Rangers’ depth players have been getting a lot of praise over the past few weeks, all of it deserved. But three weeks ago I wouldn’t have thought their depth players were quite this good, and they’ll be facing the best defense they’ve seen so far. Maybe that keeps up. Maybe that’s one of those things that changed when the team started winning against Pittsburgh. But it’s the thing I’m most afraid won’t continue. Here’s the other thing about the Rangers’ offense: They’ve needed production from their depth players because they’re not getting enough of it from their top guys. Brad Richards had a good series against Philadelphia, but had just three points against Pittsburgh and two against Montreal. And while Rick Nash snapped his goal-less streak in the last round, he has just three goals in the postseason. The Rangers should be able to slow the Kings’ offense, at least a little. But they can also expect Los Angeles to give them trouble: The Rangers used their quickness to exploit defensemen against Montreal (and in earlier series, too). That won’t be as easy against a team as deep and experienced as the Kings. A team can afford to be less-than-spectacular offensively when it’s so good at preventing goals. (Lundqvist has been awesome, but he has a really good defensive corps playing in front of him.) But the Rangers, in the first two rounds especially, got by without everything clicking for them. They can’t afford to do that against Los Angeles. They’ll need every goal they can get. I’m just not sure they’ll be able to get enough.